One of our most reliable training tools is leaving treats for the dogs when we leave the house. Many years ago when it was just Alycia and Tito, she realized that his separation anxiety would be lessened if she left him a small Kong filled with treats when she left the house. This tradition took hold and became our routine. When we leave the house Shadowfax gets a large Kong filled with treats and capped with peanut butter that has been frozen. It takes her a little while to get through the frozen peanut butter and get the treats out, and provides her a challenge and a little snack. The dogs have learned to look forward to us leaving because they associate us leaving with tasty treats. I would highly recommend this approach to anyone with dogs with separation anxiety. 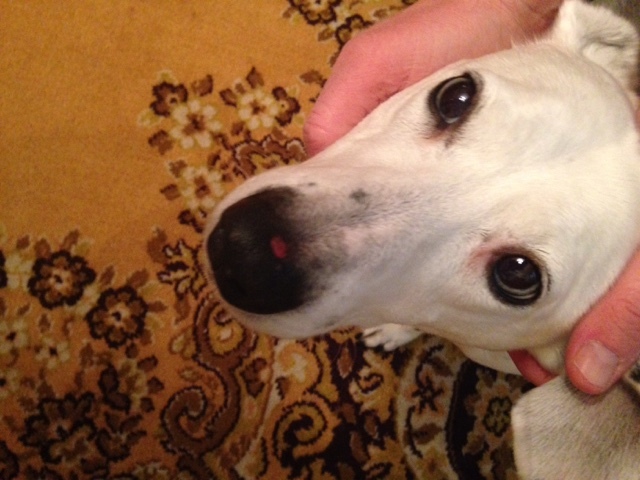 We came home a few weeks ago to find Shaak Ti with the scrape on her nose you see in the pictures above. We were unable to find her Kong Treat Ball. These two facts only mean one thing, Shaak Ti has hidden her treat ball somewhere. I looked all over the house for 15 to 20 minutes, but neglected to look outside. It was near 0 with snow flurries and a brisk wind, so I figured that there was no way she'd gone outside and buried it. I was wrong. Shaak Ti is good at a lot of things, but digging is not one of them. 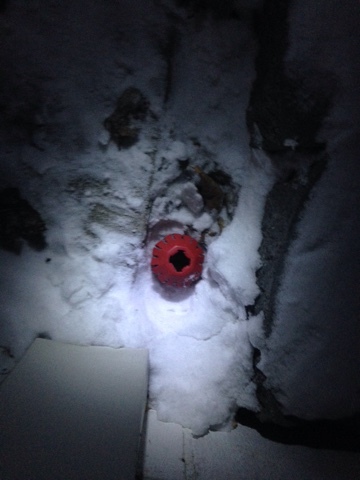 She had left her Kong Treat Ball just laying on top of the snow, barely buried. It's likely that she had it buried or hidden elsewhere, but moved it here when she realized that we were on her trail. 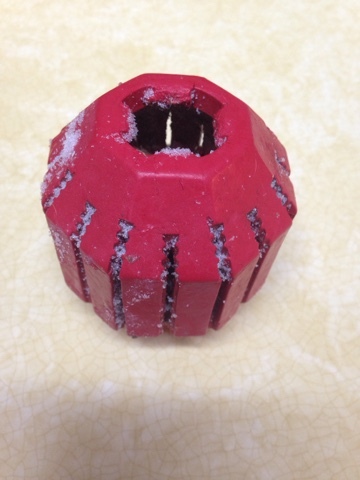 This Kong has held up for several years (maybe even 5 years), but is starting to show some wear. And leaving it out in sub-zero temperatures sure doesn't help. It might be time for a new one.